Focal has been making some radical changes to its entry-level loudspeakers. The 26-model Chorus V range has replaced the 54 models of the Chorus S and Cobalt S ranges. That's still a lot of speakers. 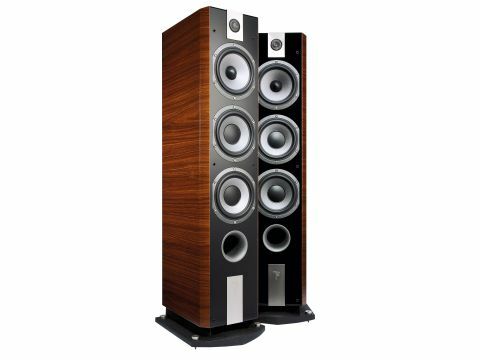 So, in order not to baffle its potential customers, France's biggest speaker maker has divided Chorus V in two, creating the entry-level 700V range and the 800V 'affordable luxury' alternative. The Chorus 826 V is the penultimate speaker in the 800 V range, sitting below the 836 V (which has an extra bass unit) and above the 816 V floorstander and 806 V and 807 V standmounts (pricing starts at £499 per pair for the 806 V). The 826 V is a three-way with a pair of 165mm bass units, a matching midrange driver and a 25mm aluminium and magnesium tweeter. Unlike previous Chorii, both cabinet and drive units are built in-house, and the tweeter drive unit (dubbed with the mystery acronym TNV) is housed in a very attractive casting. Curiously, this speaker no longer uses the 'W' sandwich-coned units of earlier models. Instead, the new Chorus V range uses drivers made of a polyglass skin over a foam core. Given that the W glass cone has been at the core of Focal drivers for so long, this is slightly surprising. However, we are told that the new V2 polyglass cones are subjectively better sounding than the W cones used in the preceding Chorus range. The most immediately striking thing about the 800V range is the style. This was achieved with the assistance of Paris based designers Pineau & Le Porcher, who have used black acrylic for the wrap of top, front baffle and rear, and combined this with angled side cheeks finished in 'Moka' or 'Ebony' veneers. These look very luxurious in the flesh, especially the dark brown Moka. The more affordable 700 V range is available in only one finish (dubbed Amati) and does not feature the polished black acrylic or cast alloy base of the floorstanding 800 Vs. It's not all styling either. The angled sides of the box are reflected inside to remove one set of parallel surfaces and reduce standing waves. Another more drastic design revision over previous ranges is the inclusion of significantly greater port area. Having listened to alternative port placements, the engineers at Focal went back to the drawing board and looked at the Reynolds coefficient - this states that when the airflow in a port exceeds six metres per second, it effectively becomes sealed. In the original Chorus range, this airflow speed was reached at only three watts input, which meant that power handling was compromised. By combining front and down firing ports in the floorstanding 800V models and increasing vent diameters, Focal has managed to keep the port working up to 30 watts input. This increases the contribution that the port makes to the bass by up to 6dB. The 826 V features a cast alloy plinth that raises the cabinet's base to allow airflow from the lower reflex port. This plinth incorporates a V shape and this is reflected in the grille top, should you leave the latter on. The grille certainly looks better than a stack of drive units and enhances the overall aesthetic of the speaker by making it look slimmer than previous models. As with all Focals, there is only a single pair of terminals, the company being one of the few with the confidence to eschew bi-wiring in favour of total predictability of incoming signal. In action, the 826 V requires a reasonable amount of space and plenty of power to give of its best. The high sensitivity would appear to facilitate lower powered amps, but only if you ignore the big dip in impedance in the upper bass. This is something decent power supplies will be able to cope with. In other words, low power from a good valve amp is better suited than a low-power budget integrated. But then again, this is a revealing enough speaker to mitigate against using it with most budget amps. Ultimately though, the choice of low power designs is academic; you won't be able to comfortably push the speaker to high levels without something approaching 100 watts on hand. As the cast alloy base comes with rather attractive spikes, we used these initially on the floor alone and latterly on some Townshend Audio Seismic bases, which had a profound effect on the balance. On the regular footing, the Focal has a nimble yet robust balance that errs on the exposed side at high frequencies. However, it doesn't come across as bright, once your ears have adjusted, and this is a pretty rapid process. The degree to which this is noticeable also depends on the reflectivity of your room and how loud you like to play. At low to medium levels in particular, the extra precision of imaging and detail brought by pointing both speakers at the listener is extremely useful. Turn the wick up, however, and things are more comfortable, with the speakers' axis crossing in front for a deep soundstage or placing the speakers parallel to the walls for a wider sound stage. The decent sensitivity and wide bandwidth of the 826 V make it a highly entertaining and engaging speaker, the sensitivity giving good dynamics and decent power handling and the bandwidth conferring powerful bass and an open, revealing top end. The aluminium/ magnesium alloy tweeter is smoother than standard aluminium varieties but not as warm as non-metal types. It is rather good at picking out tape hiss and cymbals, but fortunately doesn't make a big deal out of them. While this speaker was in-situ, Resolution Audio's Opus 21 system turned up for a forthcoming review of the XS (or Extra Sources) unit, combining FM tuner, phono stage and both analogue and digital inputs. This low-powered amp system doesn't deliver the grip of bigger amps, but allows the speaker to reveal considerable quantities of inner detail in everything played. This is a process that draws the listener into the music in no uncertain fashion and leaves the reviewing notes looking rather more like a description of the music than the speaker - and that's always a good sign. The 826 V is clearly a capable and revealing speaker, one that is easily neutral enough to be led by the components in front of it. It is also sensitive to its support. Placing a Townshend Seismic base underneath significantly bolsters the bass, which has the knock-on effect of calming the treble, all of which improves the high level experience considerably. Despite the degree to which this base decouples the speaker from the floor, the extra energy it was pumping out had both floor and furniture vibrating with enthusiasm when Wyclef Jean was played 'in anger'. Next to the £1,500 ATC SCM19 standmount we tested last issue, this Focal concedes some definition in the bass and is less able to 'disappear' from the soundstage. On the other hand, it delivers a more open, relaxed and 'juicy' sound, and some will find it easier to live with both sonically and aesthetically.